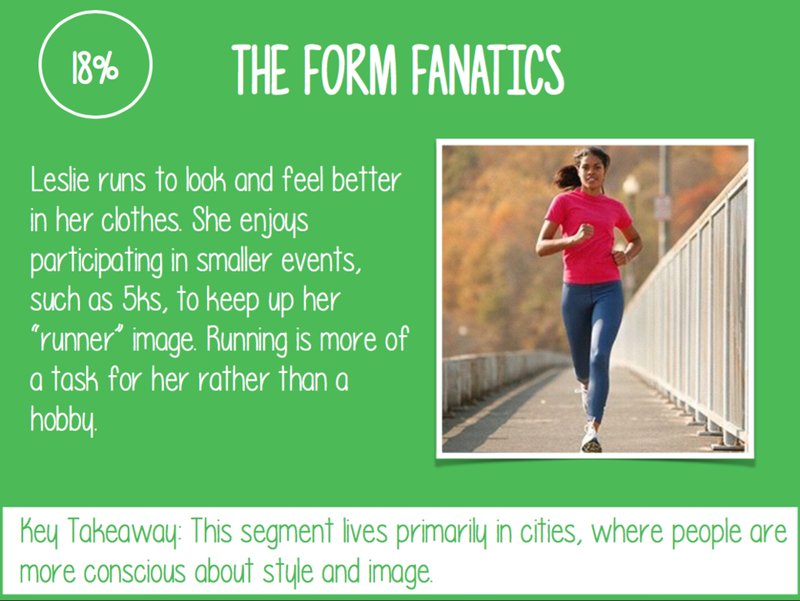 Conduct a segmentation study on runners, then present the findings to a client. First, the team used secondary research to define the scope of the behavior in general. We then narrowed it down to long distance running. Next, we conducted a quantitative study to understand the behavior further. We then analyzed the results and identified these segments. Sports Backers, Inc., based in Richmond, VA - producers of nationally-recognized sporting events and programs. This client was chosen for its aggressive pursuit of opportunities to expand its scope of annual sporting activities, its quest to transform the Richmond metro area into the most physically active region in the country, as well as for its focus on improving access to places for physical activity. Renovation of Sports Backers' existing stadium - this would address concerns of especially the Competitive and Straightforward segments, who want a safe and convenient place to run all year-round without any concerns about the weather or their safety.